Don't Panic Wedding Series: Can't Afford Flower Centrepieces.... Now What? We wanted to just touch on the flower topic today! Every bride in Dubai asked the same questions, why are flowers in Dubai so expensive, aren’t there any local flowers that we can use to help with our budget? We will answer your questions but first a little facts and figures. The UAE has been credited with owning 30 per cent of the total number of flowers, plants and trees imported into the GCC. The industry has been valued at AED 556 million, with the Netherlands ranking as the top country from where the imported horticulture products are sourced from. While all types of flowers are available here, There’s nothing you can’t get. But, as all flowers are imported it does get very expensive. Its not like the UK where you can choose home-grown or seasonal flowers. So this answers your question why flowers are so expensive and also sadly due to the harsh weather conditions here and soil quality. So what are the options for of budget conscious brides? While a peony-laden table will never NOT work, for the modern bride or bride on a budget, thinking outside the box to create a flowerless reception is an exercise in creative thinking. The possibilities are endless (but can also go tacky quite quickly, so be sure to edit yourself) and, if executed well, can result in Instagram fodder the likes of which your guests will be talking about well after the party has ended! Here are some of our favourite flower alternatives from Rock Your Wedding HQ. Is there anything more romantic than a wedding with soft lighting? We stumbled across this cool company that offers cordless, dimmable lamps. Not only its innovative cordless lighting but also they’re aesthetically beautiful designs and ability to adapt to the environment their in. 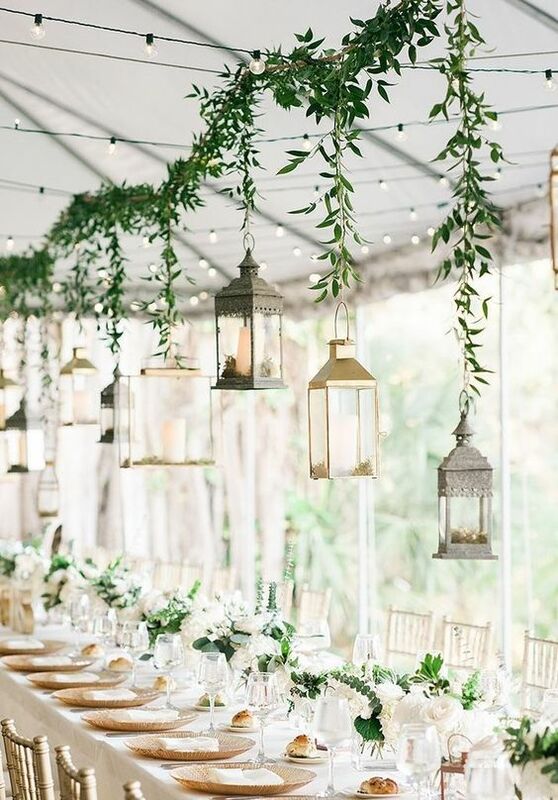 This year foliage made it into weddings in a big way, and we couldn't be happier, foliage makes a statement in a way that flowers just can't, it's modern, beautiful and slightly edgy and we love adding it to all aspects of the day. It can be used as a table runner with candles or as a hanging statement over the tables. Why not use fruit and vegetables for your centrepieces. We recently did a trip to the Ras al Khor Fruit and Veg Market. You can find some amazing bargains. All you need to do is add a wooden bowl or vase with some candle sticks and ta da you have something amazing. 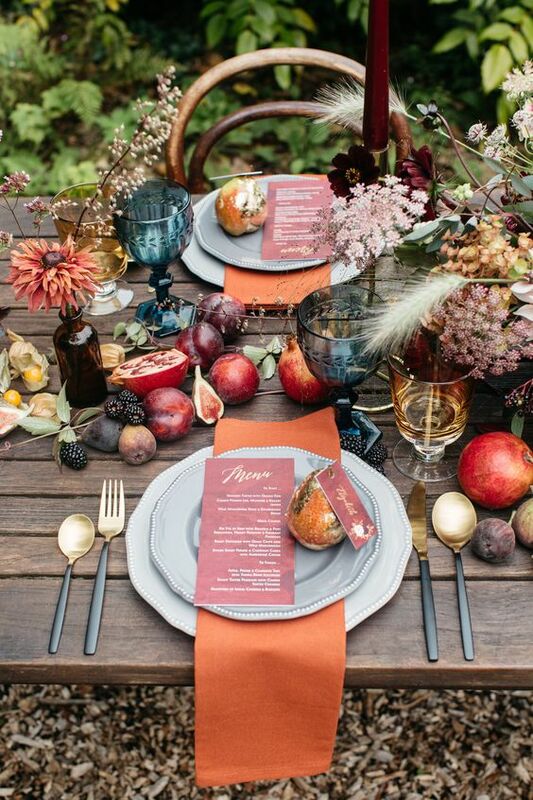 Figs, pomegranates, and blueberries add a very vintage flare to the look. If you were going for a Tuscan theme a great way is incorporating your starter into the centrepiece. Being inspired by fresh Mediterranean foods. You can have a beautiful display of cold meats, cheeses, nuts, crackers and olives. By adding candle sticks and a mix of brass vessels and wooden boards it will deliver a very striking and unusual set up for your guests. The best part is nothing goes to waste as the guests get to eat it. We truly hope that this post has given you some food for thought and got your creative juices flowing. Honestly start with a theme and know what you like and then the rest will follow. But don't feel you have to use flowers there are many more fun options.